What is your job title in Cara Vets? What made you want to be part of the veterinary world? Since I can remember, I have always wanted to be a vet. Always involved in anything animal related. I qualified from University College Dublin in 1997. When did you join Cara Vets? I worked in Newry for 8 years in a Small Animal Practice before joining Cara Vet Group in 2006. Everything! Consulting, surgery, dentistry, radiography. Reproduction is a special interest of mine. The people and their pets. Trying to help someone as I would like them to help me. Who is one of your most memorable patients and why? When I started to think about this one, there are so many clients and pets that I cannot single any one in particular out. Your pet's name & breed? Where did they come from / how did you meet? Uisce: Was born in a stable yard - one of a litter of 10 black pups - Uisce was the pup with the white horseshoe of hair on her chest. Uisce chose me. She followed me about every morning while I mucked out. Eventually the owner of the yard told me to take 'my dog' home. We have enjoyed agility over the years but she has retired now and enjoys her days on the sofa. Indie: I fostered the 2 youngest pups in the dog pound for the Christmas period in 2014. Indie stayed with me and her sister lives with my Grandmother now. We enjoy all sorts of training and agility. Indie loves going for a run with Uisce. Al Pacino: Retired now and enjoying his retirement. We enjoyed showjumping, dressage and cross country. I have owned him since he was a 9 year old. Outside the practice, Tracey has a keen interest in Dog Agility and loves Horse Riding. 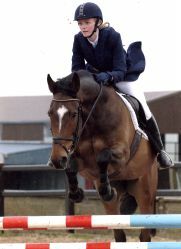 She is an member of the riding club and enjoys competing in TREC competitions. Click here to view Tracey's Pets!